This special edition show style grille guard is now offered with Hunter brand. This guard really tips the scale of real style showing off more beautiful stainless steel by adding an additional Safari Bar, and cross bars for more headlight protection. 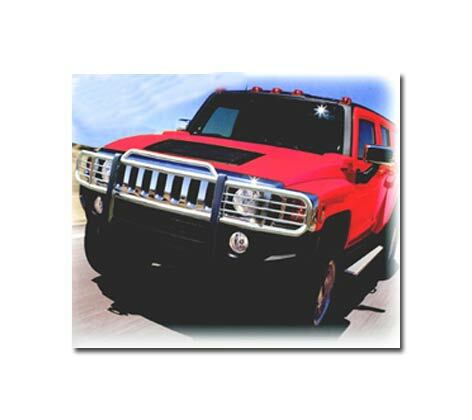 Made of 1.5" and 1.25" stainless steel tubing and 1/4" thick stainless steel plates.Hunter Grille Guards provide customized front end protection for the headlight and grille areas of the vehicle. Each grille guard is designed specifically for that vehicle model, contouring to the lines of the front end while providing an easy, hassle free installation with no drilling required. Mirror Polished Stainless: Marine grade T-304 stainless steel for maximum protection. I ordered the grill guard for my 2004 Ford F150 Monday morning and got it today Wensday. WOW that was fast!! It was almost over night. GREAT JOB! I just got done putting on the grill guard it was like 45 minutes to install. And I have to tell you it looks GREAT the Stainless steel really makes it stand out. I have never ordered anything over the internet before and was kinda worried about the quality. But once again Great job. Stainless steel has a mirror like finish. Thank You for the great service and good quality product.